My brother-in-law has a meat stall in Birmingham's indoor food market and while he always does a roaring trade in fillet steak, lamb chops and sausages, his stocks of pigs' trotters are normally slow moving and are mainly sold to Brum's Chinese community. However, he reports that sales of 'porkie feet' are changing! The sales of pigs' trotters are soaring, thanks to a revival of old-fashioned cheaper cuts of meat. 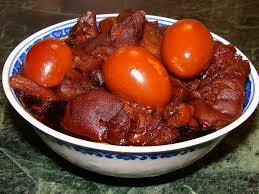 Apparently, the nation's appetite for pork cheeks, shanks and beef brisket has also grown. 'Forgotten cuts' as they are often called by those in the meat trade are being increasingly stocked in supermarkets too, while celebrity chefs are encouraging shoppers to think about using recipes that were popular in more austere times. Well, we ARE in austere times again! Trotters which are still popular in France, China and the southern sates of the USA, were commonly eaten in the UK until the 1950s. But after decades of being out of fashion, the big supermarkets have seen sales jump. Waitrose reports that sales of pigs' trotters have increased by a third from last year, with pork cheeks and shanks are showing a similar increase. Beef brisket sales, a beautiful tasty meat when slow-cooked, has risen by 20%. Waitrose has had these forgotten cuts of meat on their food counter for almost nine years now, in the wake of the financial crisis. Since then, the other supermarkets have introduced their ranges of cuts that include beef shirt, ox cheek and offal. All the meats of my childhood - and don't forget the pigs' brains! 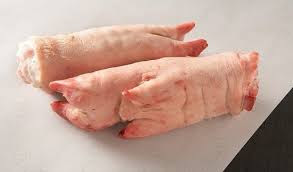 If you do not have a local meat market, where you can get the cheapest trotters, then they are generally sold from the fresh meat counter at about £2 per kilo, which means that one trotter typically weighs 450g and would cost just under a £1. Cheap, cheap, cheap! But they are not just a bargain, advocates of 1950 revival recipes argue that the food tastes better. Added to this, trotters have been charged with being a health food, as they are rich in collagen, the protein responsible for skin and muscle tone. It seems that UK shoppers are increasingly looking for cheaper cuts of meat that do't compromise on taste or quality. 'So how do you cook pigs' trotters', I hear you say. They are usually simmered for three hours in a stock until the meat falls off the bone. 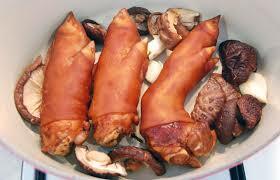 Boiled trotters can also be coated in butter and breadcrumbs and then baked for 30 minutes. You can also deep-fry or barbecue them. If you want more help with cooking trotters, then the recipes on Waitrose's website are proving popular. They have dishes using lots of forgotten cuts - searches for smoked pig cheeks with plum ketchup are up by 30% on last year and slow-cooked cheeks with pea tops and seared scallops up by 150%. Searches for American-style roast beef brisket have gone through the roof. This significant growth in our search for cheaper meat dishes has been championed by many chefs and restaurants, The growing use of forgotten cuts in the main stream is giving us more confidence about trying recipes using these odd cuts at home. Why not buy some pigs' trotters today - you won't regret it!